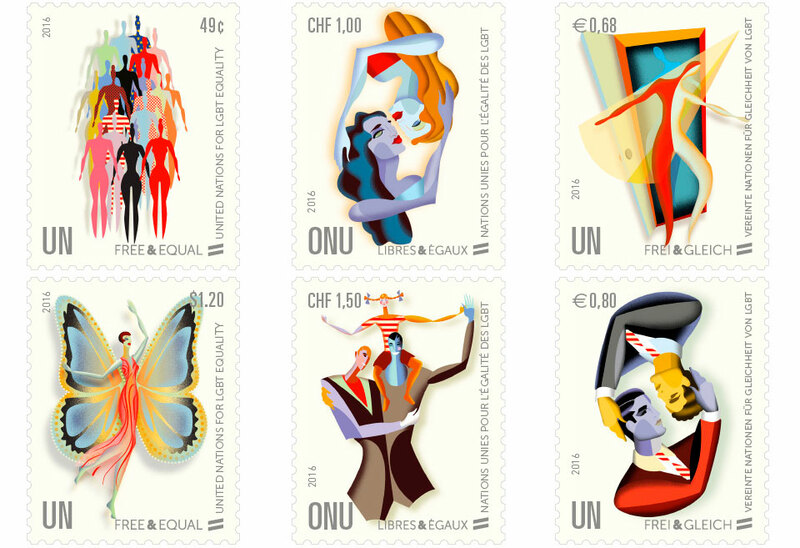 United Nations Free and Equal postage stamps promote LGBT equality around the world. Photo: United Nations Postal Administration. On February 4th, 2016, the United Nations released a set of six new stamps to promote UN Free & Equal, the ongoing UN push for LGBT equality. The stamps, featuring pictures of gay and lesbian couples, queer families, and a trans woman, are the first set on this topic issued by the UN Postal Administration. Sergio Baradat, the Cuban artist who illustrated the stamps, took inspiration from French Art Deco from the early 20th century, an era in which, in some ways, the LGTB community had more social freedoms than they do today. “We live in a world where even though [developed] nations have embraced marriage equality, LGBT equality, we still have a far, far way to go, but we are making some strides,” said Baradat, who identifies with the queer community. “There are some countries in the world right now where not only are we not celebrated or respected, but we are beaten and killed. And I thought that it would be a wonderful opportunity using art, to use postage stamps as a vehicle – using art to change hearts and minds,” he added. Baradat and the UN both want to make the point that LGBT rights are human rights, and though small, the stamps send a wide-spread message. Coming in English, French, and German, they’re available online and at the UN Headquarters in New York, Geneva, and Vienna. They’re worth 1.20USD or .80Euro, the cost of an international letter, but are only valid for postage if mailed from their respective UN Headquarters. Hopefully, one day Baradat’s art and message will have a broader footprint.